"By the grace of God you have been called to a a life in which everything is inspired by the sacrament of the Eucharist. You must grow in daily knowledge of this mystery and in a greater love for the Lord who gives Himself in it. The celebration of the Eucharist is the centre of your life. It is the highest expression and the strongest support of your life in community. It is the beginning and the end of your actions; the source and consummation of your service to God. When you celebrate the memorial of Christ give thanks to God for His countless benefits. Never tire of praising Him, one in heart and voice with your brothers, and united with Christ, the sacrifice of praise. Renew yourself in the spirit of love and unity because you are sharing with your brothers the same bread, the same cup. The celebration of the Eucharist would be nothing but a romantic or aesthetic sensation should you forget that the heart of it is the self-giving of Jesus. The sacrifice of yourself for the sake of others is the single foundation of every community. Unite yourself with the Lord, then, in a fruitful and acceptable offering for the life of the world. Each day you are nourished at the Lord's table and filled with his riches so be ready to break the bread of your life for the poor and hungry everywhere in the world. Keep nothing for yourself but share with others all you have received from God's tenderness. In the bread of the Eucharist and the cup of blessing Christ's presence is revealed at its most intense. Let your life be permeated with a tremendous reverence towards this mystery of faith. Your adoration needs no justification more than your love and wonder for the infinite, delicate grandeur of God, the unfathomable depths of Christ's gifts. Let his praise not depart from your lips. Life drawn from the Eucharist makes all kind of demands on you to proclaim the meaning and the greatness of this mystery. You are called especially to give the sacrament its full effect in unity, brotherhood and service. The unity of all Christians and all men must be closest to your heart. Always and everywhere you are called to rise above oppositions and divisions in the universal love of Christ. Always look for what unites and fight everything that estranges and separates men from each other. Your calling gives you the privilege of living the eucharistic mystery to the full. So reject nothing with the Church enjoins on your faith, and accept nothing that might obscure the full meaning of this sacrament. To Christ the Lord who dwells every present in His gifts you can bring your life's adoration. Your whole life must be worship in spirit and and in truth, your whole existence a celebration and adoration of the presence of God. 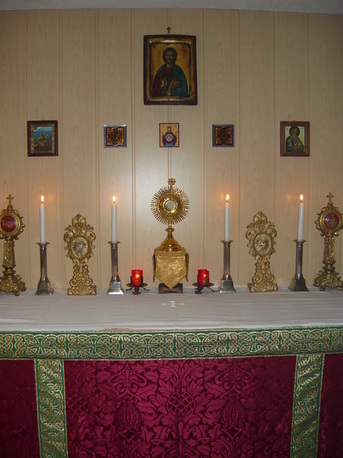 Your life is to be poured out in prayer and adoration before the Eucharist, and there it will be inspired afresh. In this way give glory to the Father through Him, in Him and with Him. The Eucharist sets you on the way of Christ. It takes you into his redeeming death and gives you a share in the most radical deliverance possible. And already the light of the resurrection, the new creation, is streaming through it from beyond. Whenever you sit at table with the risen Lord, it is the first day of the week, very early in the morning." O Thou who in this adorable Sacrament hast left us a living memorial and pledge of Thy marvelous love for mankind, and dost therein graciously draw us into wondrous and mystic communion with Thee, grant us so to receive the sacred mysteries of Thy Body and Blood that our souls may be lifted into the immensity of Thy love, and that, being filled with a high endeavour, we may ever be mindful of Thine indwelling Presence and breathe forth the fragrance of a holy life. Amen. Called to a life of Eucharistic Adoration? 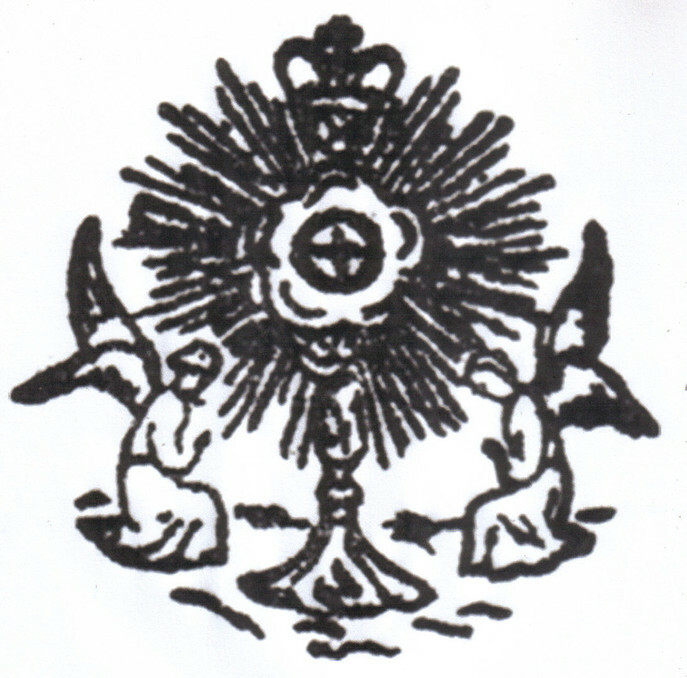 "the adoration of the Most Blessed Sacrament and the help of Mary as the ultimate salvation"
Bl- Maria Franciszka Kozlowska, "Mateczka"